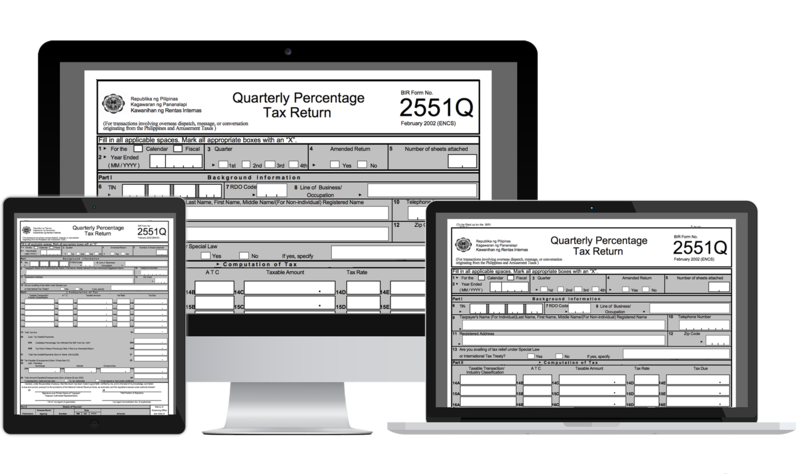 Currently, the updated version of this form comes with additional ATCs (Alphanumeric Tax Code) such as PT010, PT040 and many others. Taxpayers who are VAT-exempt with annual revenues not more than 3,000,000.00 (PHP). Financial institutions such as banks, finance companies, agents of life insurance companies (foreign), and any related financial intermediaries. Franchisees of gas/water utilities , radio/TV broadcasting with revenue not more than ten(10) million pesos. Domestic and international air/shipping carriers. Under Republic Act No. 10963, also known as the Tax Reform for Acceleration and Inclusion (also known as TRAIN Law), 2551Q forms shall be filed every 25th day after the taxable quarter.